Em's Knitty Corner: More knitting! See, I haven't forgotten aobut you! 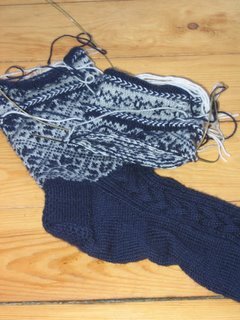 The first sock is done, and I'm almost finished with the first repeat on the second sock! They do look awfully big to me, so it's possible you'll have to rip them a bit and redo the toe, I hope you don't mind, but I would rather have them a bit big then to small! The colours are more acurate in the close-up. It's simple superwash sock yarn. I regret now using a 2,5mm addi instead of 2mm, but it's ok. I hope to finish these soon. 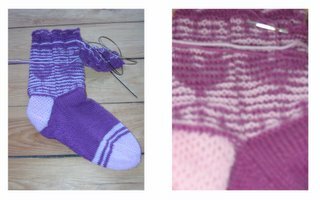 Sock yarn, superwash (Arnell), 2,5mm round needles. I'm using a basic pattern made up out of a variating of other patterns, and added the little lace for fun. Well, I want to have fun while knitting these. I need to make 7 pairs like this (well, maybe with another fantasy to them) for my mom, and then I need to knit 5 more pairs in some kind of purple colour. It's for the childrens play I'm in. I'm playing one of the 7 witches and my mom wants us all to wear these. I have 6 more weeks to finish these, though I give myself 4 weeks (this one included). 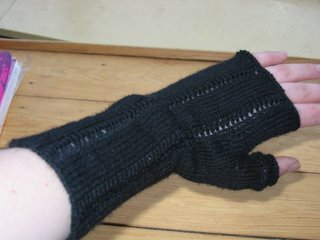 I finished this glove in about 2 days, so I should be able to make it, right? The cardigan for my mother is not getting anywhere at all. I just don't feel like knitting it, while I just promissed her to get it done by the end of the week! Yikes! I'm thinking of dropping the lace pattern and just knitting it raglan style on big needles. The yarn can do with it. I'll take some pictures tomorrow! Thanks for those interested in my possible sock yarn. I can do 2 kinds : 100% merino (handwash) or 70%wool, 30%poly (superwash). Both are nice. I'll try to get some pictures of the yarn I already did (and knitted up) and I'll try to dye some more in the coming few days. I spent the whole day organizing and cleaning. Much more cleaning to do, but I'm pleased with myself as it was a productive day. I really should be getting to bed now, more tomorrow! OMG! Rip them did you say? Not on your nelly! They are beautiful....can't believe they are mine!